The ALZO 100 Cool-Lite Tent Kit is a complete and versatile solution for jewelry photography and small object imaging. 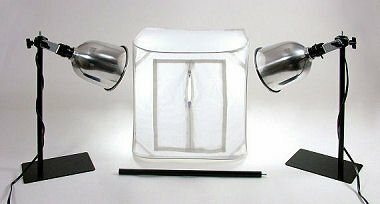 The kit consists of 2 ALZO 100 Cool Lites, a 14 inch photo tent, and a 16 inch extension pole. The ALZO 14 inch tent is supplied with 3 different background sweeps including Black, Neutral Gray and White. ALZO 100 Cool Lites are small yet very versatile lights with a full range of height and angle adjustments up to 32 inches high (with included extension rod). Each light uses 1 ALZO 45 watt CFL bulb with 150 watt Tungsten-equivalent light output. Color temperature is daylight 5500K. The kit comes complete with a 16 inch extension rod that can be attached to either of the ALZO 100 lights to allow the light fixture additional height for top illumination of the tent. This offers the same versatility as lights on light stands without the expense. The ALZO 100 light with a 8 diameter reflector is properly proportioned to the ALZO 14 inch tent, and thus allows for unique shadow control.